Cleanse skin with the creamy comfort of the 4711 Cream Soap, a richly lathering bar that can be used in both the bath and the shower. The mild and non-drying formulation works to lift away dirt and grime, and smoothes the skin in one step. 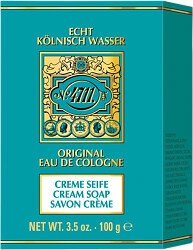 The skin is infused with the distinctive 4711 fragrance, making for a luxurious bathing experience. Lather up all over the body for a quick and convenient top-up of the refreshing 4711 scent, and indulge in the zesty scent of bergamot, lemon, lavender and neroli. 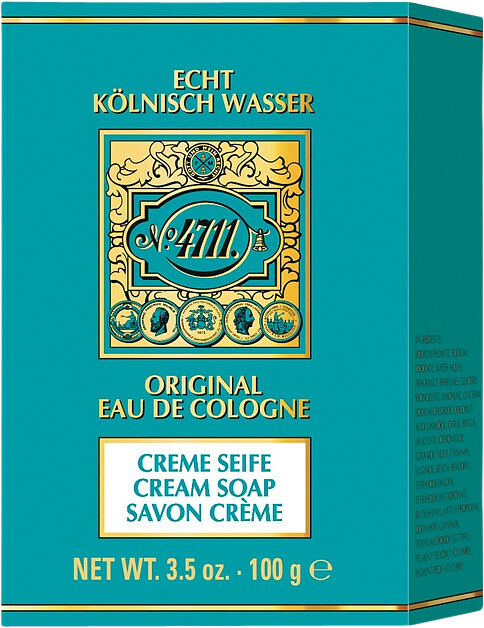 4711 Original Cream Soap 100g is rated 4.2 out of 5 by 10. Rated 1 out of 5 by Maria123 from Not worth it I am in a search of a natural moisturising soap as I am trying to cut the plastic by not using shower gel but unfortunately this soap is not what I want, it makes my skin dry, smells like cheap old stuff and it runs quick. Rated 5 out of 5 by Juanita from 4711 soap. if you like the original cologne, this is for you. Strong smell, lovely and authentic. Good price . Rated 3 out of 5 by Kitty28 from Bit disappointed I found the level of perfume very low, hardly evident. And I have noticed that the soap seems to be drying out my skin. Not a great purchase. Rated 5 out of 5 by andrex from lovely refreshing smell for summer i have not used this yet, but when i unpacked my parcel i could smell this lovely refreshing fragrance through the packaging! delightful refreshing classic scent for summer.